Example of a civilian model jacket design based on the N-1. The N-1, to a lesser extent of then the Air Force A-2, MA-1 and N3-B became somewhat legendary for being a well-serving, functional jacket. The problem is one had to enlist and end up in certain positions to receive one. Post WWII patterns and probably sometimes even surplus were converted for civilian use. 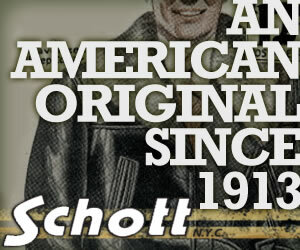 Today you still see similar jackets being produced by everyone from Schott to Abercrombie and Fitch. The Jacket seen here has a very similar cut and fabric composition as a Navy issue N-1. Unfortunately the liner is made up of a blended pile and not what would have been alpaca. Still the rugged cut and warmth make these civilian versions a great option for someone who wants the style at a fraction of the price for an original. ← Vintage 1940s/50s Embroidered Lee 101-J Red Label Riders Jacket.